Arteast is run solely by volunteers, members like you who contribute a little of their time to ensure that the organization can provide its many programs and run its exhibition venues. Without the help of its members in volunteer roles, Arteast would not be the dynamic organization it is. Don't forget that, by volunteering, you are not simply working for other members, you are working for yourself and making Arteast work for you. Make Arteast work for you by becoming a volunteer. Arteast needs a member to step forward to take on the role of Vice President in January 2016. You can make an important contribution to your organization and help shape Arteast's future by joining the Executive in this capacity. The key purpose of the VP is to support the President and assist that person with their duties. t is not essential to have professional experience as an executive or a manager but you should have organizational skills, good judgement and common sense....attributes that we all develop from life's experiences. You have what it takes and your organization needs you for VP. If you are interested in helping in these capacities, please contact me at president@arteastottawa.com or 613-830-1829. Arteast est une association dont les membres sont des bénévoles. Des membres comme vous, en donnant un peu de leur temps, assurent que l’organisation puisse maintenir ses nombreux programmes et activités. Sans l’aide bénévole de ses membres, Arteast ne pourrait pas être l’organisation dynamique que l’on connaît. Rappelez-vous qu’en étant bénévole vous ne travaillez pas uniquement pour les membres, vous travaillez pour vous et Arteast aussi pour vous. Faites que l’association travaille pour vous en devenant bénévole. Pour janvier 2016, Arteast a besoin d’un membre pour occuper la fonction de Vice-Présidente ou V.-Président. Vous pouvez être d’une grande contribution à votre association en vous joignant à l’Exécutif d’Arteast. Les fonctions clés du VP sont d’aider la Présidente et de l’assister dans ses responsabilités. Il n’est pas nécessaire d’avoir une formation professionnelle comme exécutif ou en gestion mais d’avoir des aptitudes d’organisation et d’un bon jugement… qualités que vous avez développées tout au cours de vos expériences de vie. Vous avez ce qu’il faut et votre association a besoin de vous comme VP. Si l’une ou l’autre de ces fonctions vous intéresse, S.V.P., veuillez me contacter : president@arteastottawa.com or 613-830-1829. 2nd floor gallery at 255 Centrum Blvd. Presents Katherine Jeans, well known film maker and visual artist. “In search of the Existential Moment” An Artist crossover between TV/film and Visual Art. Collaborative and isolated. Marketing your work in today’s Social Media and Multi-Media platforms. What to expect from Broadcasters and Galleries. From Katherine Jeans website:Through my career in film I have been conditioned to see the world at 24 frames a second. To freeze a moment ultimately challenges my notion of what is perfection. Through video installations and paintings I hope to challenge your thinking to look beyond just a beautiful flower or a scene from nature but to share with you an ephemeral moment that can never be repeated. Contradictions of this dimension will be the tension between what I perceive is perfection and what the viewer sees it as. After all beauty is in the eye of the beholder. Jessie Parker’s photographic images operate on both the physical and metaphorical levels pushing the envelope technically and visually. She goes beyond the “traditional” depiction of subjects, playing with what is real and what seems real but isn’t, the visionary and the transformative, re-presenting the world and inviting us to see otherwise. In these photo-based digital works she uses digital “paint” with a special “pen” used like a brush, applying digital “paint” stroke by stroke to the image in a technique which allows her to be inventive, interpretive and intuitive. Maritime born and schooled, Jessie received her B.Ed and BFA from Mount Allison U., under Alex Colville, 1965. She has lived in Ottawa since 1979 and has shown extensively in Maritimes, Ontario, USA. She stock photos have been published worldwide since 1987. Her talks at the national Gallery pulled in record crowds in the ‘90s. Her recent eBooks for Visual Artists and new paperback are published by Amazon. She is a featured speaker at ArtSchoolFair 2015. Célébrons 25 ans à voir en grand! Dans cette nouvelle exposition au centre des arts Shenkman, les membres d’Arteast vont présenter leurs œuvres grands formats! Le public est invité au Vernissage de l’exposition «25 ans…à voir en grand!» présenté par les membres d’Arteast. La réception aura lieu le dimanche 27 septembre 2015, de 13h à 15h au niveau 1 du Centre des Arts Shenkman, 245 Boulevard Centrum, à Orléans. Dans cette nouvelle exposition « 25 ans…à voir en grand! » Arteast est fière de présenter les œuvres grands formats de ses membres. Dans ces œuvres, on y retrouve plusieurs médiums, ainsi qu’une grande variété de styles et de sujets, représentatifs de la haute qualité des artistes membres d’Arteast. Arteast showcases the large format works of its members in the latest Exhibition at the Shenkman Arts Centre. 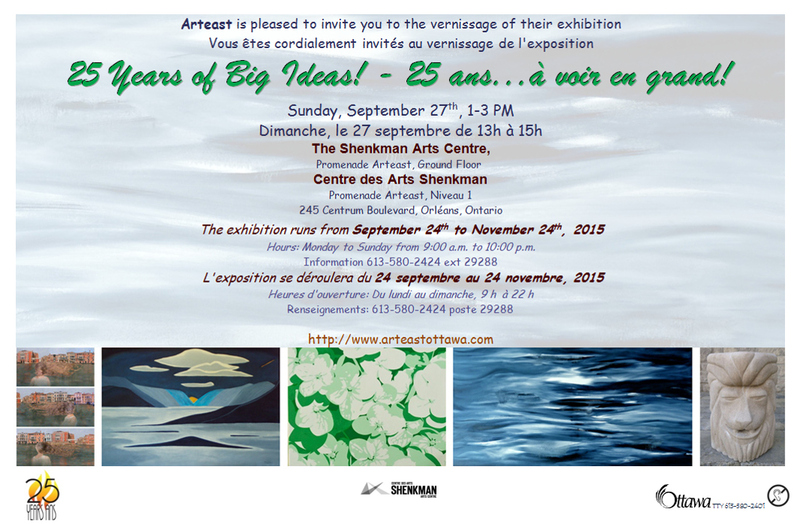 The public is invited to an opening reception for “25 Years of Big Ideas!” the latest show to be presented by Arteast. The reception takes place on Sunday, September 27, from 1 p.m. to 3 p.m. on the ground floor of the Shenkman Arts Centre, 245 Centrum Boulevard, Orleans. Arteast is pleased to present the diverse works of its members, comprising many subjects, styles and mediums. These large format works of art showcase the varied media that Arteast members employ and are representative of the high quality of work produced by its membership. On October 31, and Nov 1, there is a new event, headed by David Lidbetter, called ARTSCHOOLFAIR. There are demos and workshops about various painting and drawing media, techniques, subjects. Also exhibits by various art supply companies and some arts organizations. Times are Saturday, Oct 31, 10am-5pm, and Sunday, Nov. 1, 9am to 5pm. The event is to be held at the Hellenic Centre, Prince of Wales Drive. Artist speakers include Charles Spratt, Susan Ashcroft, David Jones, Jeff Banks, John Day, David Kearn, Jayne Couch, Matthew Collins, and others. Artist supply demos include Winsor and Newton, Golden Acrylics, Gablin, Faber Castell, Liquitex. The only seminar/lecture as a business talk is “Money Smarts for Visual Artists” by Arteast member Jessie Parker. The lecture includes some juicy critical tidbits from her eBook series plus some surprising bonuses about artist estate issues. One bonus is about the new legislation just in effect for the first time this year. The other bonus about a little known ruling which can save the artists’ estate 5 to 6 figures in tax!. Her talk is 9:30 to 11:00am, Sunday November 1. Seating is limited. Go to http://artschoolfair.com for full details and to register. You will have the opportunity to customize with the events of your choice. With at least 2 seminar choices, get a 15% discount if you register before September 21. Des copies imprimées seront disponibles à la réunion mensuelle L’Art en herbe et à la galerie Promenade Arteast au Centre Shenkman. Si vous préférez lire le Communiqué en ligne, s.v.p. contactez : editor@arteastottawa.com afin d’enlever votre nom de la liste d’envoi postal. Step into the studios of local visual artists. Celebrating the newest of three ASP locations, these four artists’ studios are located in a heritage building in Vanier. Collage, assemblage, mixed media artists and visual arts collaborators will be on hand to invite visitors into their studios for viewing and discussion. Friday September 25 6 to 9 p.m. Ten emerging and established artists invite curious minds to indulge in conversation and interaction as the artists paint, draw, digitally assemble artworks in their studios and exhibit their work. Friday, September 25 7 to 9 p.m.
Saturday, September 26 10 a.m. to 3 p.m.
Sunday, September 27 10 a.m. to 3 p.m. Inside a small white bungalow at Britannia Beach are five artist studios. Let curiosity get the better of you – talk and interact with accomplished visual artists as they exhibit sculpture, painting and other media in their studios. Friday, September 25 6 to 9 p.m.
Entrez dans les studios d’artistes visuel d’Ottawa. Ces quatre studios d’artiste sont situé dans un édifice patrimonial de Vanier, le dernier de trois nouveaux édifices qui offrent des studios dans le cadre du programme. Des artistes de collage, assemblages, technique mixtes et collaborateurs en arts visuels seront sur place pour accueillir les visiteurs dans leurs studios, où ils pourront admirer des œuvres et prendre part à des discussions. Douze artistes établis et de la relève invitent les curieux à interagir et discuter avec eux alors que ces derniers peignent, dessinent ou font l’assemblage numérique de leurs œuvres dans leurs studios ou les espaces d’exposition de la galerie du Programme de temps libre en atelier.